The NFL (National Football League) International Series has made London its home over the past ten years. As the event moves into its second decade of bringing American teams across the Atlantic to play in front of London crowds, interest in American Football in the UK has been growing exponentially, and goalposts supplier Harrod Sport has been there from the very beginning. In 2007, Wembley hosted the first ever regular season NFL game to be held outside the US. This became an annual event which expanded to three games in 2014, and, to mark the tenth year, increased again to four matches in London and one in Mexico. One of the things that makes the Series so engaging is that these matches are not exhibitions or pre-season warm-ups. These are genuine, regular season matches, which means both teams will field their strongest players and prepare as seriously as they would any other NFL matches held in the US. For the franchises involved, the International Series is an excellent opportunity to develop their fanbase outside America and for UK fans. Having multiple games each year means that the NFL is no longer a novelty – it is becoming a British tradition. This competitiveness has led to many great London matches. In the Series' 10th anniversary year, for example, the Jacksonville Jaguars dramatically held off the comeback of Andrew Luck's Indianapolis Colts who scored three touchdowns in the final quarter, but still lost 30-27. The Cincinati Bengals and Washington Redskins went to overtime in 2016 resulting in a high scoring draw, the first of the series. But possibly the most dramatic result so far has been the Detroit Lions remarkable 2014 comeback against the Atlanta Falcons. In that game, the Lions recovered from 21-0 down at halftime to win with the final kick. After missing the first field goal attempt, Lions kicker Matt Prater was lucky that the officials spotted a foul, giving him another attempt. This time he scored, completing the remarkable 22-21 comeback in front of 83,000 delighted fans. 2017 again saw London hosting four games – two at Wembley Stadium and two at Twickenham. The first saw the 'home' side, Jacksonville Jaguars, defeat the Baltimore Ravens at Wembley. This is the fifth season in which the Jacksonville Jaguars have played a home game at Wembley, and with a deal agreed for this to continue until at least 2020, their UK supporter base is steadily growing. 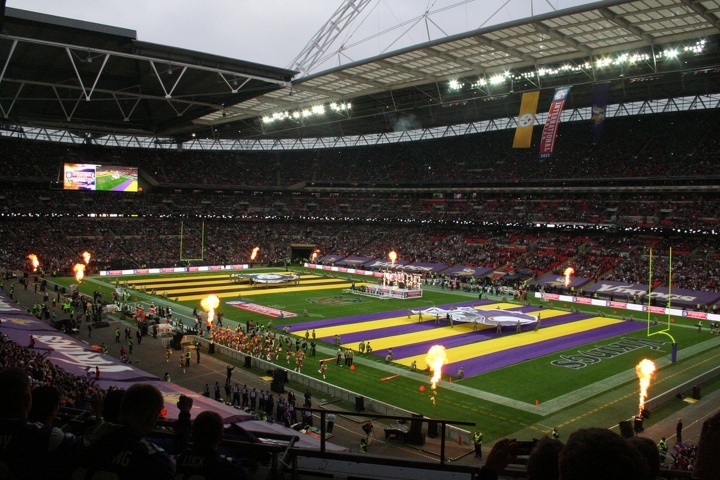 The second Wembley match followed a week later as the New Orleans Saints defeated the Miami Dolphins, who returned to Wembley for the first time since the inaugural International Series match against the New York Giants in 2007. Twickenham took over hosting duties in late October as consecutive weekends saw the Arizona Cardinals face the LA Rams and the Minnesota Vikings play the Cleveland Browns. With the appearance of the Arizona Cardinals, Baltimore Ravens and Cleveland Browns in the 2017 International Series, there are now just five of the 32 NFL teams who have not yet taken part in London. Excluding the Seattle Seahawks and the Green Bay Packers, every Super Bowl-winning franchise has appeared at least once. Looking forward it seems that the International Series is only going to continue to flourish. As well as the games currently being played, the NFL have signed a deal with Tottenham Hotspur to play at least two games a year at their new stadium until 2027. But could London's enthusiasm for American football lead to a UK team in the future? Unlike in European sports, NFL teams occasionally move cities. Since 2016 both the Rams and the Chargers have moved to Los Angeles, and the Oakland Raiders' proposed switch to Las Vegas has been approved. The NFL regular season only requires eight home matches. So, if the number of games held in London continues to rise, it is likely that before the International Series enters its third decade, NFLUK (the UK branch of the National Football League) will make the case that London is ready to adopt a franchise. Having been involved in the NFL International Series from the start, Harrod Sport are proud to supply the posts for these incredible matches. 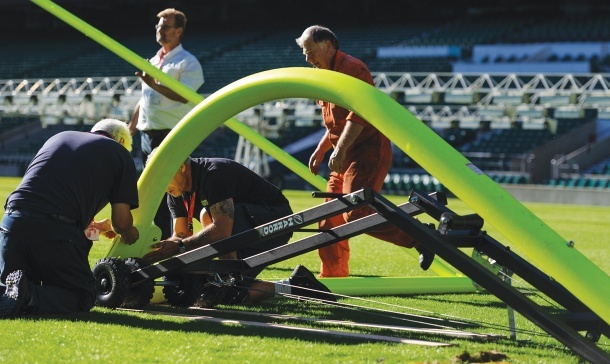 Designed to National Football League standards and regulations, Harrod Sport's posts have been used at every International Series match since 2007. And it is not just the NFL. Harrod Sport's posts are also installed at Croke Park and the Aviva Stadium in Dublin for College football matches, giving Irish fans the chance to watch NFL stars of the future face off. 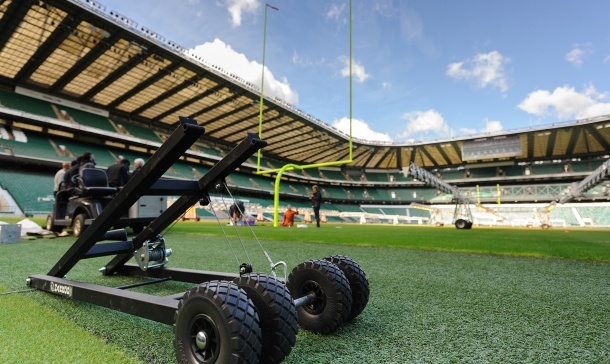 Harrod Sport's NFL posts were initially designed and manufactured from steel to match those most commonly used in the US, however in 2016 on request from the ground staff at Wembley Stadium and Twickenham, the posts were redesigned in aluminium to make them lighter and easier to handle and erect. "We have been privileged to partake in many prestigious sporting events in recent years, from multiple Commonwealth Games, Rugby World Cups to both a home and an International Olympic Games." Said Kevin Utton, Director of Sports Sales and Marketing at Harrod Sport. "Our goals and posts flank a lot of the world's greatest pitches, but few are as striking as the luminous, 13.7m high NFL posts with their iconic single gooseneck upright."